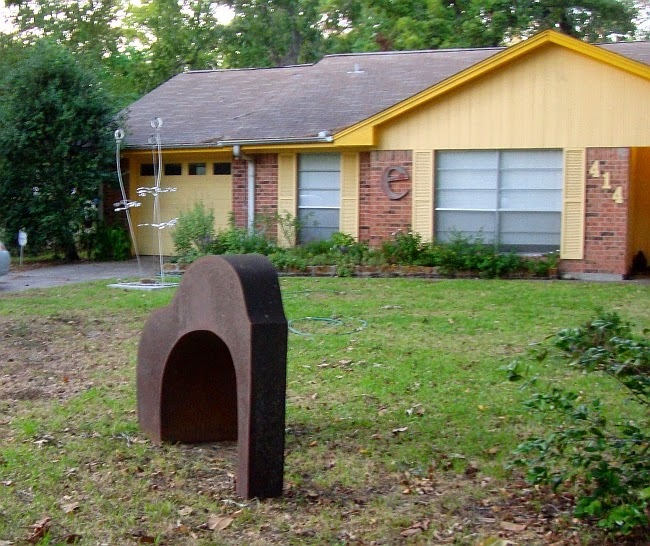 After work today, I thought I'd drive around that part of the Independence Heights neighborhood where I had found Independence Art Studios and the residences of several sculptors. I wasn't expecting to find much I drove around all the streets south of Tidwell between Shepherd and Yale, going from North to South. I checked out Janisch Rd. and Martin St. again, just in case I had missed anything. The next street further south is Thornton Rd. I drove down it slowly and found myself staring at a field full of sculptures. The address was 404 Thornton. I will apologize in advance for not getting more photos. The sun was shining in such a way that it made it hard to see what I was shooting, and there was a fence. (That said, it is worth stopping by. The Glover's dogs will bark at you, but you can see a lot of interesting sculpture from the road.) Here are a couple of the pieces. 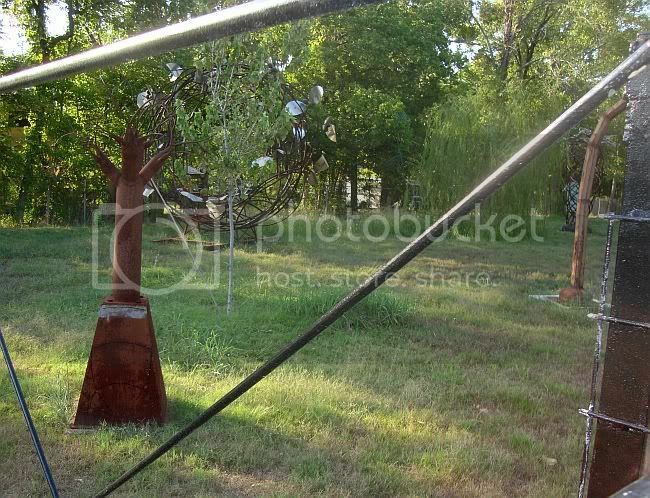 These are two of a whole bunch of the sculptures in this big yard. I guess there are about 10 sculptures there, and they aren't small, either. In the distance, there was a large workshop, and I could see someone working in it. I checked out my trusty HCAD to find out who owned this property, and it came back with "Timothy and Mary Glover." 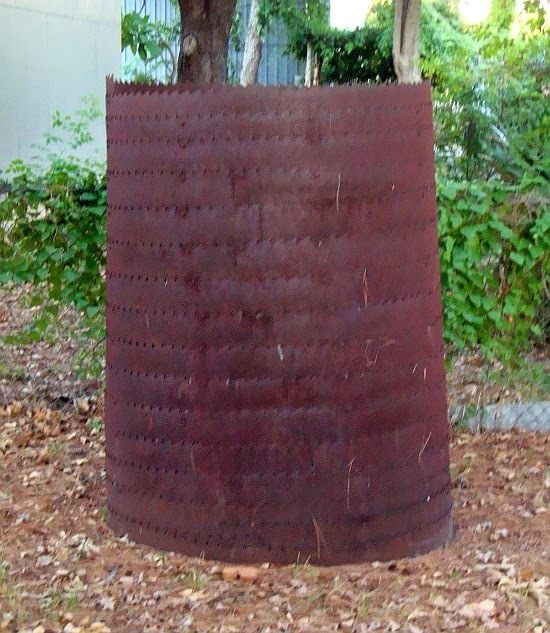 A little Googling and I discovered that Tim Glover is a sculptor who used to teach at HSPVA. There is a Mary Glover who works for Cooperative for After-School Enrichment, which has done some after school arts education locally. I don't know if it is the same Mary Glover, but wouldn't be surprised. 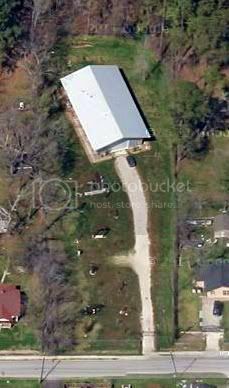 This property seems to back up to the properties owned by Brian Owens and Magdalene Boltz-Topp, so we really have a knot of sculptors, all living in the same north-south band. 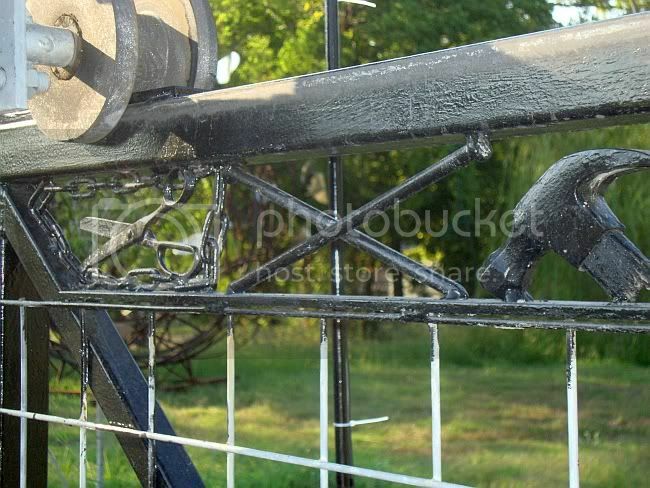 Even Glover's fence is a work of sculptural art! 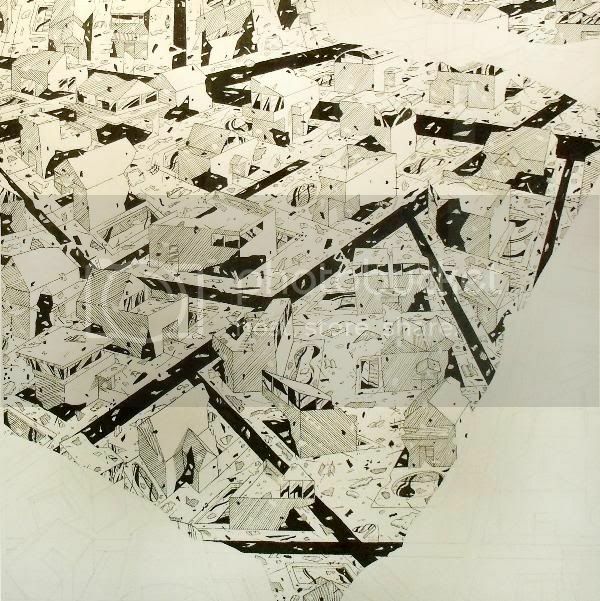 Ana Serrano is a Mexican-American artist whose work deals with urban environments (particularly Los Angeles). 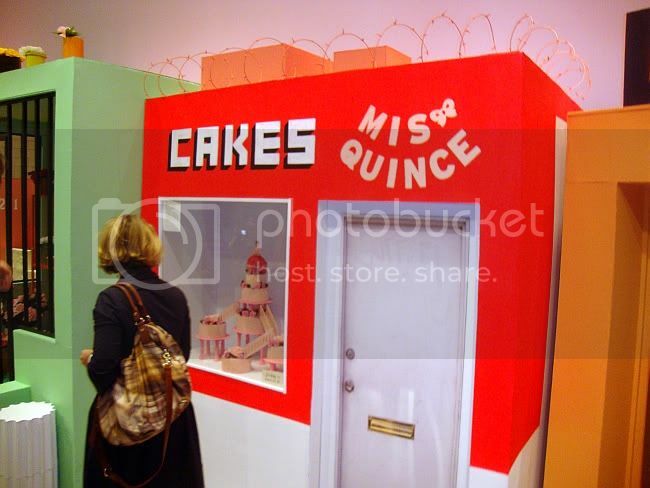 In Salon of Beauty, the new installation at the Rice Gallery, she has created kind of a walk-in diorama of an L.A. barrio. Unlike a natural history museum, however, she doesn't try to make her diorama particularly realistic. 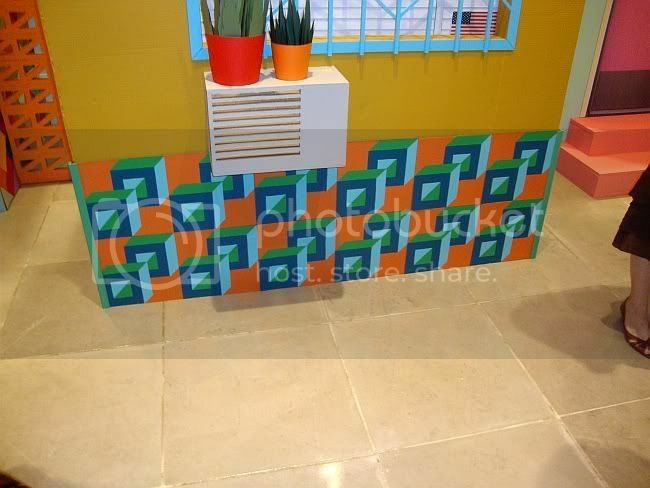 Both is scale and color, it is highly stylized. 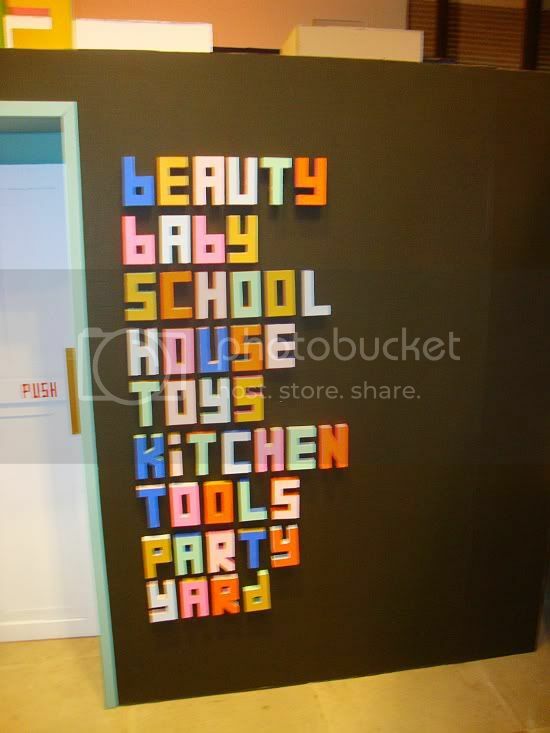 She also employs a highly original typography which doesn't look like any store signage I have ever seen. The whole effect is like walking into a cartoon, which makes me wonder if this is something that chief curator Kimberley Davenport feels a particular affinity for--Ana Serrano, Andrea Dezsö and Wayne White have each brought a cartoon/alternative comics esthetic to the gallery with their installations over the past three years. It's a large and impressive piece of work, but part of me wants to say, "so what?" The whole seems to add up to less than the sum of the parts. There are lovely and amusing details, but the combination of them doesn't strike me as particularly insightful or revelatory. The size of the piece is meant to overwhelm you a bit, but I actually think it would have been better if she had made it smaller--something on a table-top instead of something you walk through. Then the wholeness of it--and its representation of a community--would have been stronger. But as I said, the details were great. These little blue and green boxes for example, or the lettering on the strip joint. Seth Mittag's piece is oddly parallel with Ana Serrano's. 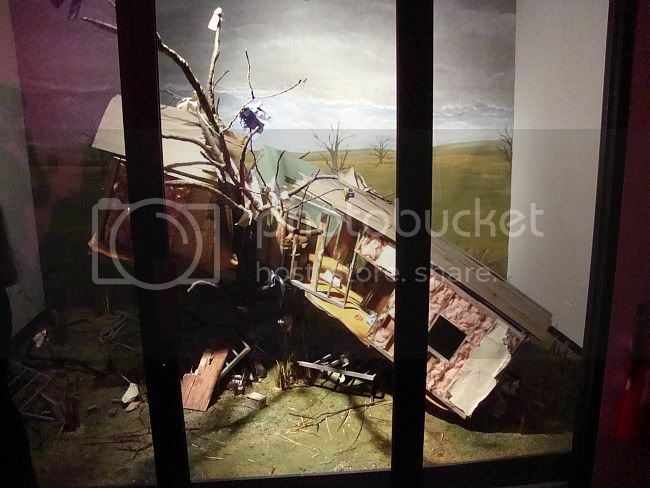 They have both made reduced-sized dioramas of buildings. 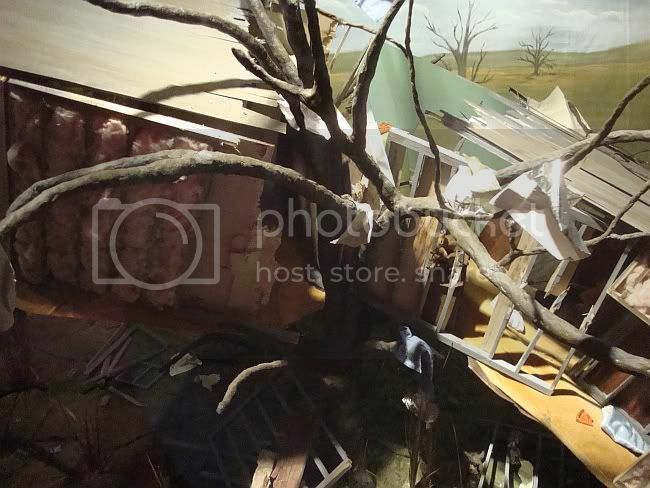 Here we have a lavishly detailed, tiny mobile home, post-tornado. Placing it in this glass case and including a painted horizon give it the feel of a natural history museum diorama, and in that way is is quite different from Serrano's work downstairs. (Given Mittag's prodigious skills at creating a realistic scale model, it was something of a surprise to learn that he commissioned a mural painter to provide the back-ground painting. It was even more of a surprise to learn that the muralist was Robynn Sanders, who has work up at the Art Car Museum right now and was one of the subjects of a recent, slightly controversial post of mine). This piece is not really a stand-alone diorama. It's actually a movie set--for an animated movie that Mittag is working on. So the best way to look at this is as a work in progress. Still, it stands up as a piece in its own right. 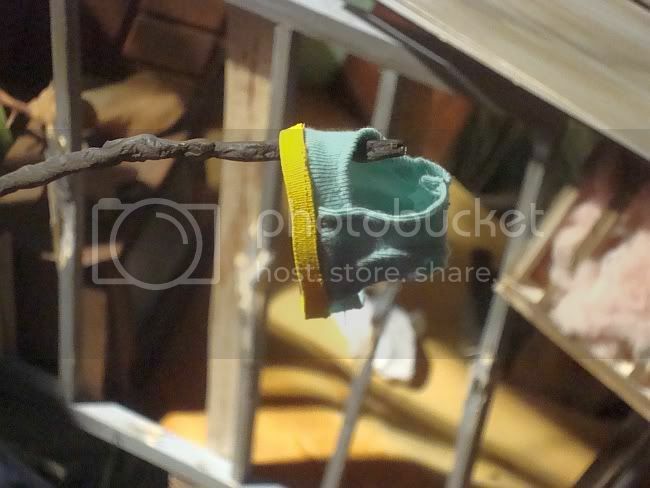 The detail is amazing--and amusing, as in the case of this lilliputian pair of underwear hanging on a tree branch. Down in the subterranean sculpture courtyard of Sewell Hall is the student-run gallery Matchbox. For their opening show of the year, the co-directors of the space decided to collaborate on an installation. But it really feels like two distinct works that occupy the same space. 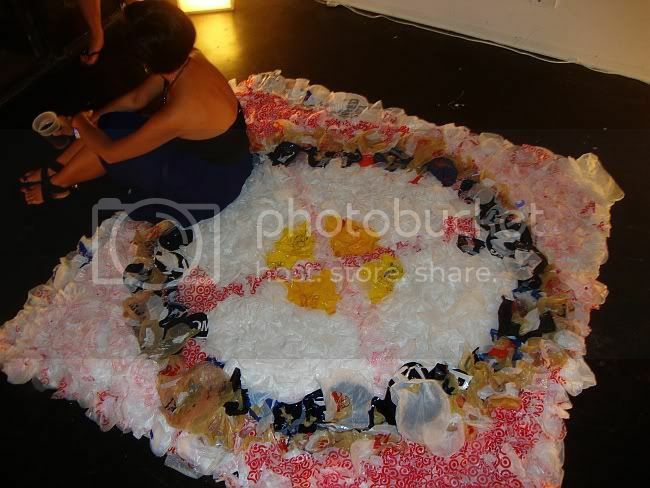 On the floor is Dolly Li's carpet made of old plastic bags. 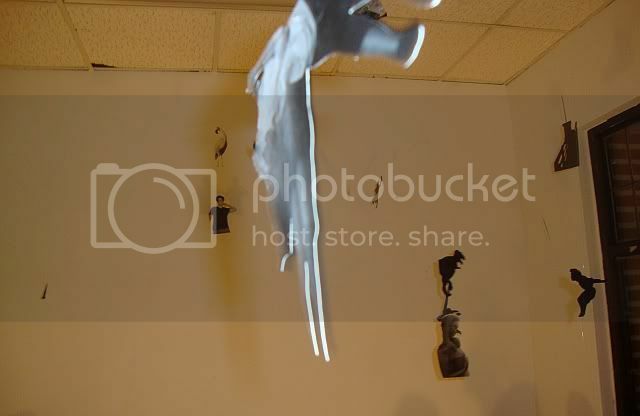 Hanging from the ceiling are cut up photos taken by Elliot SoRelle. The two elements don't interact with one another conceptually or visually (you have to look down to see Li's and look up to see SoRelle's). 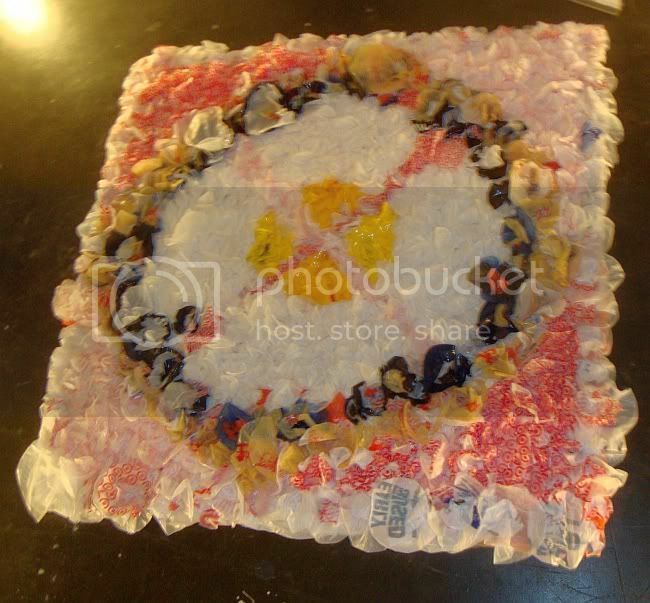 While Li's piece works fine on its own, SoRelle's is lacking--indeed, it makes me think of the half-assed artworks that certain art students would put together the day before they were due because they had procrastinated all semester. With the help of weed. I'm not suggesting SoRelle did this; it's just art student behavior about which I have some personal knowledge, yaknowhatimean? So it doesn't quite jell. That's OK--they're undergrads. I like that they did it. And I like that Matchbox Gallery, EMERGEncy Room and the Rice Gallery got together on one night to show their stuff. You have probably heard about the big new James Turrell thing being built at Rice. Called Skyspace (he couldn't come up with a new title? 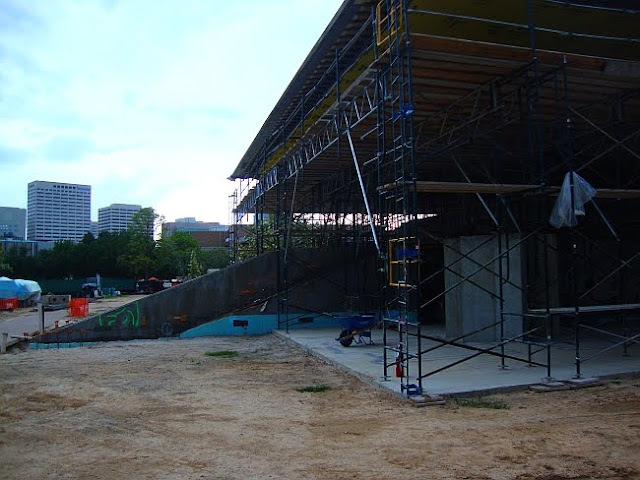 ), it will sit in front of the Shepherd School in the no-man's land between the Jones School and the Baker Institute. This is what it's supposed to look like. Ha! Fooled you. (Fooled me, too, initially. A reader with good eyes pointed out my error.) 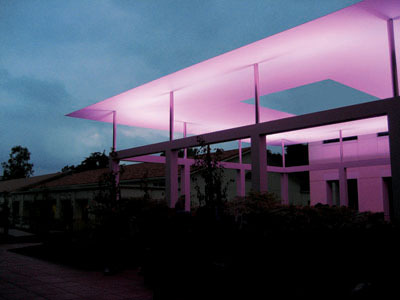 That is a photo of another James Turrell Skyspace, made in 2007 at Pomona College. He's going to keep making them until he gets it right, I guess (or until people stop paying him to). Ours is currently being built. Here it is last night (I was over at Rice for a class and for the latest Rice Gallery show). It looks like a tomb for a minor Sumerian tyrant. It really does have the look of an ancient burial mound. 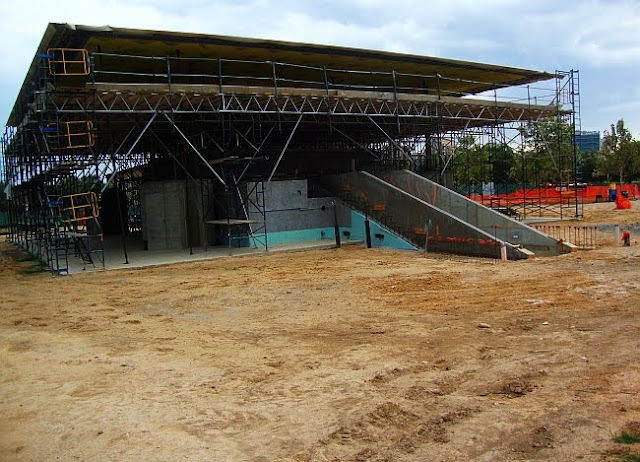 Instead, it will be apparently used as a musical performance space for Shepherd School students. I guess that's because concert spaces are something that they lack, unless you count this or this. 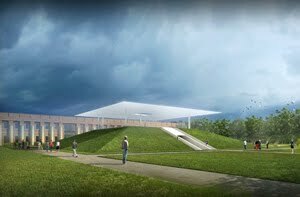 Skyspace is prominent on Rice Public Art, a new website (new to me, at least). This is a good thing to have because Rice's campus has a lot of interesting art on it, and this website provides a stroller with a guide. There's just one problem--it's incomplete. It lists nine pieces, including one in Fondren Library and one in the BioScience Research Collaborative that I don't know are accessible to the general public (I'll go check them out and report back). 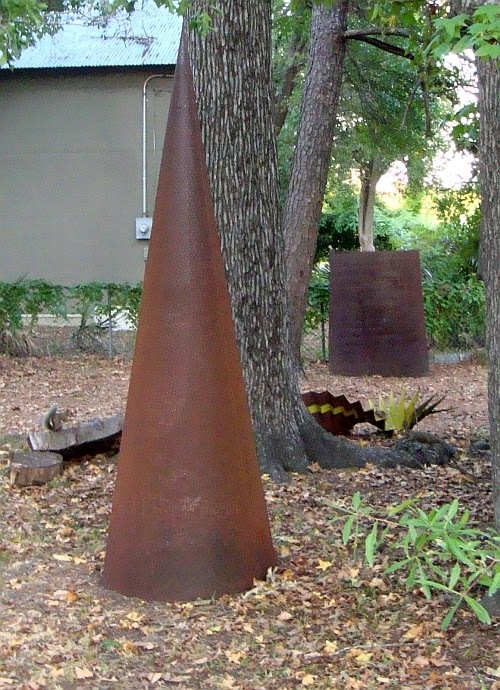 But it doesn't list Jim Love's Paul Bunyan Bouquet in the courtyard of Lovett College (is it gone?!) and most bizarrely, it doesn't list Willy's statue--the statue of William Marsh Rice right smack dab in the middle of the main quad. It's like they are only interested in showing off their newest public art (although the Heizer piece has been there for a long time). Since we have pieces by two of the big-name Earthworks guys at Rice, we should go for four-of-a-kind and get pieces by Nancy Holt and Walter de Maria. This is a map I made of Houston Art Landmarks a while back. I've added a few things and updated a few things. Please let me know if there is anything I'm missing (I would be shocked if there weren't) or any mistakes I've made. Occupy Wall Street supporters are appalled at the persistent attack on workers rights. We support the right of the workers to collectively bargain. 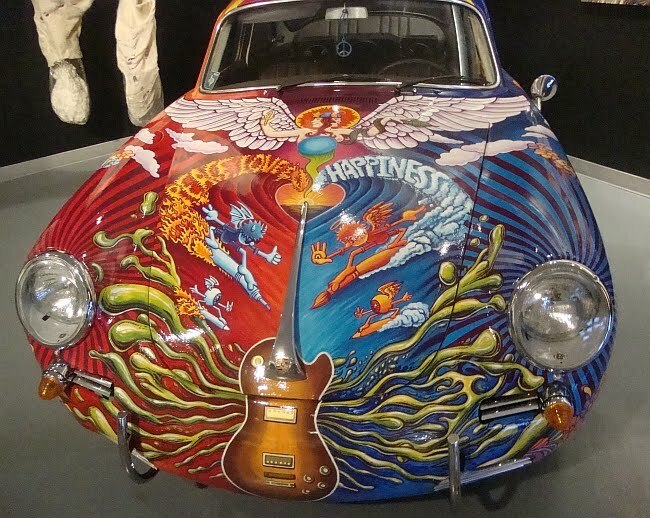 Sotheby’s wants all new hires to have no collective bargaining rights, no health benefits and no job security. 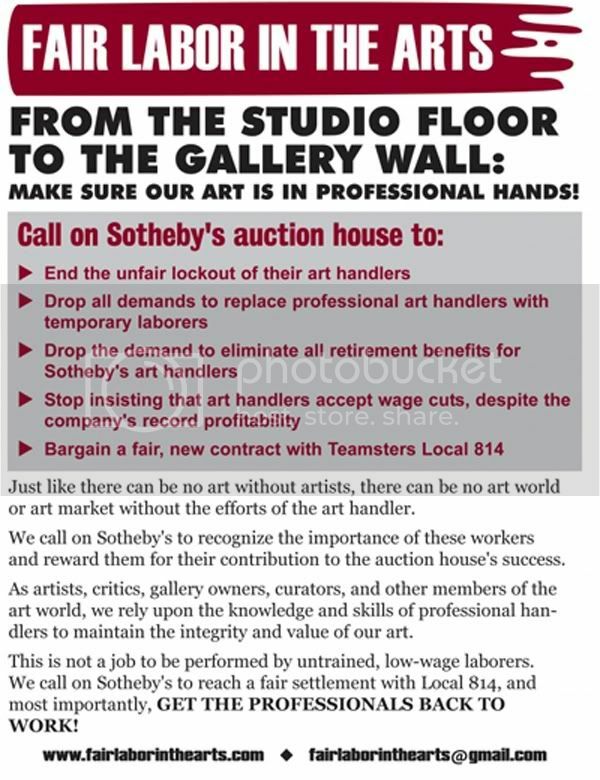 After locking out their unionized work force, Sotheby’s continues to operate using scabs and a non-union subcontractor. Sotheby’s art auctions epitomize the disconnect of the extremely wealthy from the rest of us. Make sure your free art labor fits this template! I know waking up before 2 pm on a Saturday is tough for some of you people, but it will be worth it! Virginia Frances Sterret was born in 1900 and died in 1931 of tuberculosis. 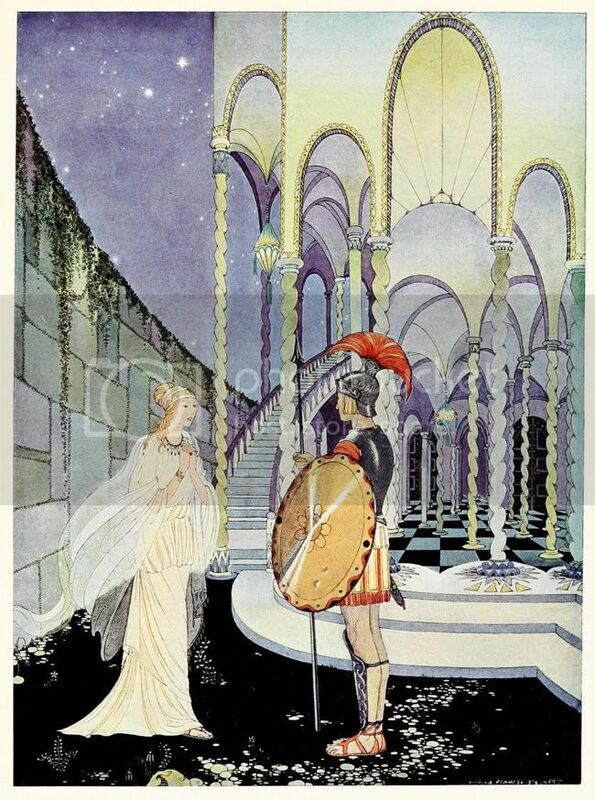 In her short life, she illustrated three books with drawings like these. You can see a lot more of them over at 50 Watts, one of my favorite websites, devoted to illustrations, book covers, and design from around the world. 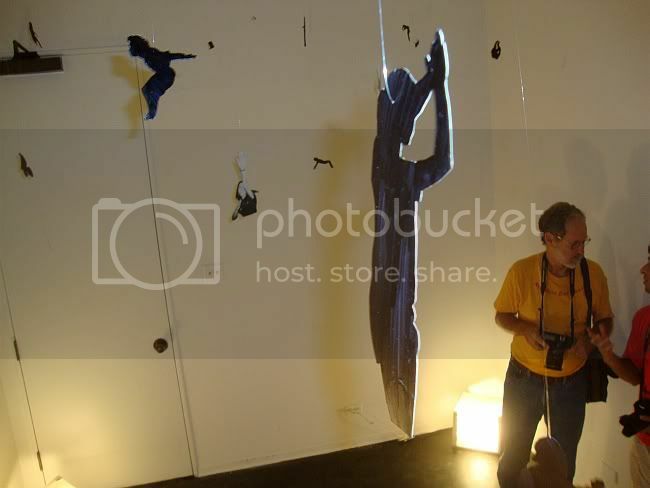 Nau-Haus honcho Dan Allison has opened a second gallery in town (has anyone else ever done this in Houston)? d.m. 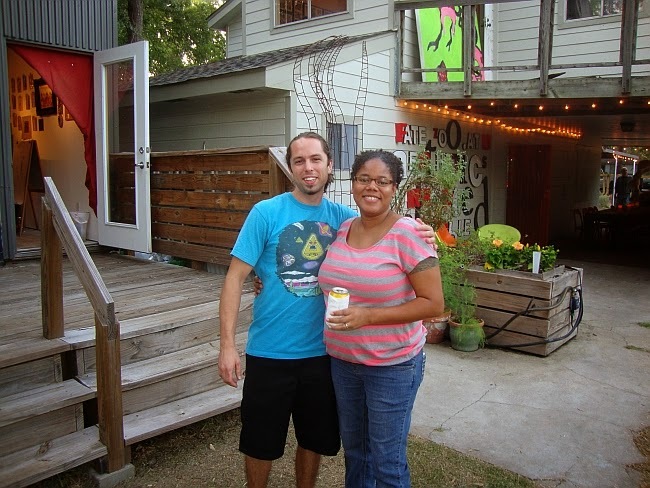 allison is located on Colquitt in a modest converted house next door to the hulking Laura Rathe Gallery. It has a large back yard, so I hope that means we'll see a few sculpture shows in the future. For now, we a have a show of paintings and drawings by Perry House. I think there is often a bias against drawings. They are seen as less exciting or perhaps as mere way-stations on the way to the final work--the painting. They often seem incomplete, especially when compared to paintings by the same artist. They tend to command less money in galleries and at auction. But in Perry House's new show, the drawings seem much more interesting than the paintings. These drawings are helped by the fact that they are inked, which is what you generally see done with comic book artwork. This creates a super-bold chiaroscuro effect. It gives the work a visual punch. 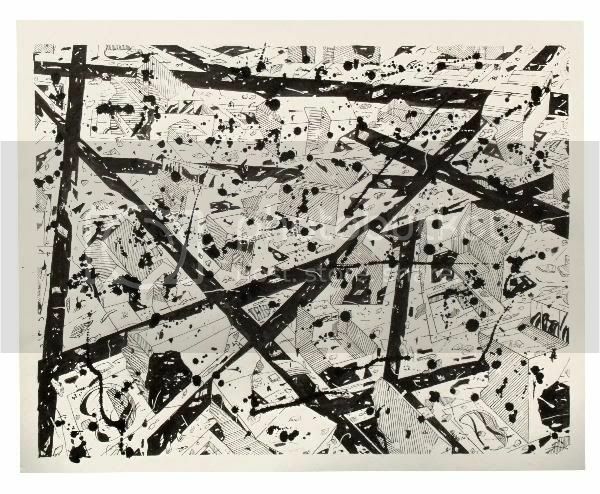 The drawings are for the most part on the same scale as the paintings--3-18-10 is 24 inches by 32 inches, so they don't have to compete on an unlevel playing field for the viewer's attention. In contrast, the pastel colors of the paintings are riotous but don't have strong contrasts in values--they lack the punch of the drawings. The overall effect is softer and less powerful. Because of the way that they are inked, the drawings remind me of comic book art. Because of their manic energy, they reminds me a bit of the work of Mariscal from the early 1980s. They are visually arresting pieces. Independence Art Studios had an open house last weekend, so I decided to go check them out. They are on Janisch Rd. between Shepherd and Yale north of the Loop. The neighborhood they are in is Independence Heights. Independence Heights was a small town founded by black families in 1916 that got annexed by Houston in 1929. What is considered the neighborhood of Independence Heights is a little bigger than the original municipality. It's a part of town I've never really visited before, and I was well amazed when I did. 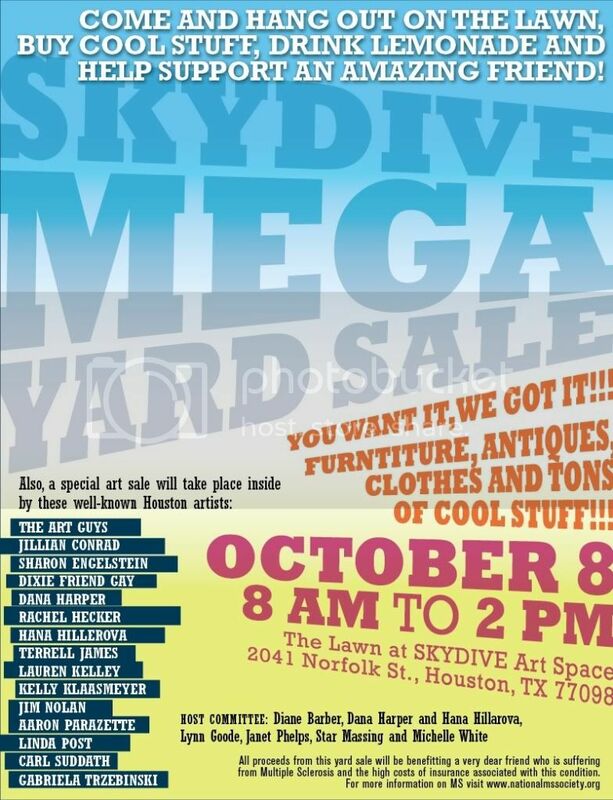 When I discover art happening in Houston--particularly art that's been completely off my radar--I get excited. 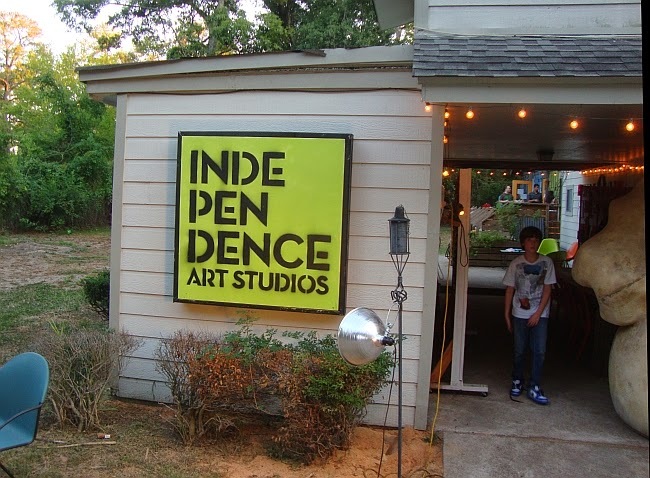 I knew Independence Art Studios existed, but I was very impressed to finally see it. 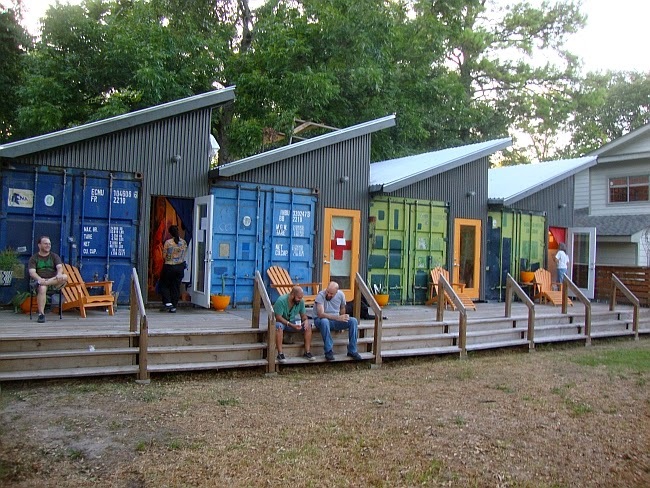 The studios are made out of old containers, and are quite roomy inside--long and thin, with a tiny loft space for storage. One artist, Jon Clark, lives in his space. Jon Clark and Chasity Sophus Porter, who also has a studio there, posed for me. 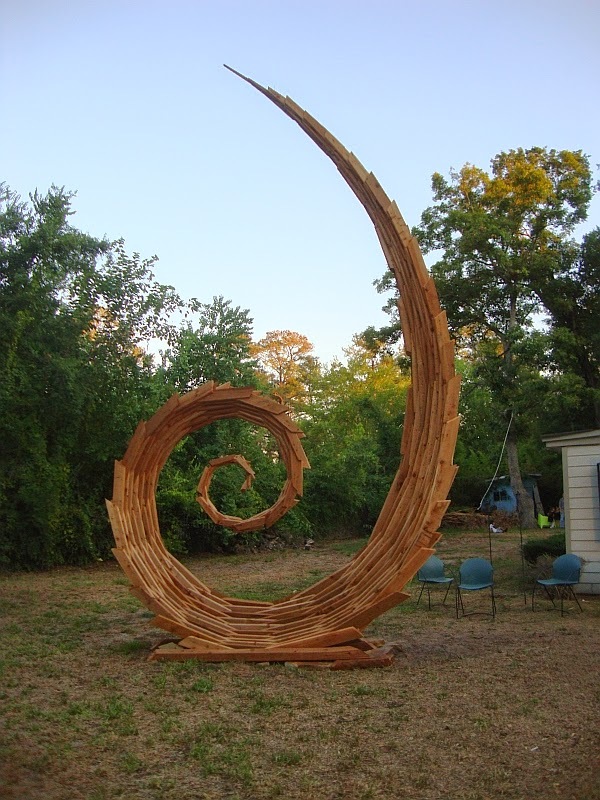 Clark had amazing piece of sculpture on the front lawn--another wooden nautilus shape. Ok, I was pretty impressed by what the Cullar-Ledfords had done. They have a thriving art colony going! Check out their website. But as I mentioned, it was a neighborhood I had never really seen. So out of curiosity, I thought I'd drive around and see what else was there. So I went one block south to Martin St. and my mind was blown. This nondescript house had a brilliant blue sculpture by Lee Littlefield in front of it. (I'm sorry I don't have a photo, but the photos I took were out of focus.) 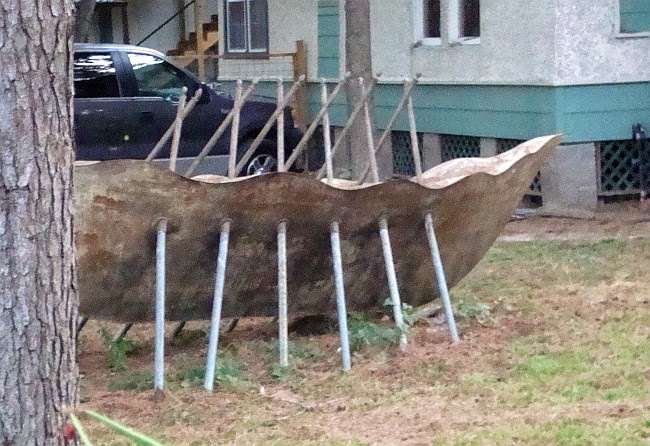 And their front yard was chock full of abstract sculptures. 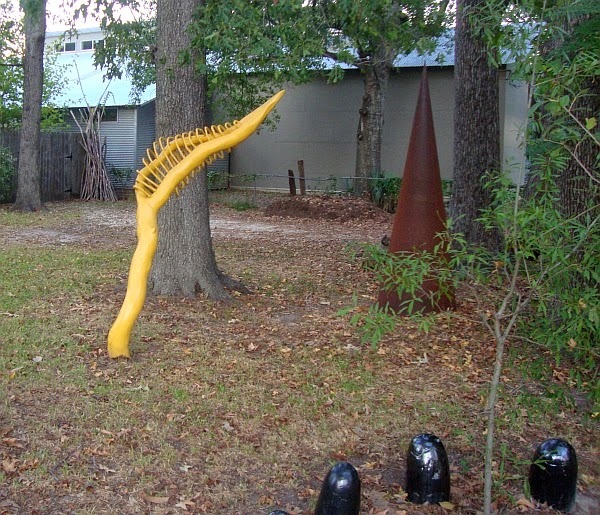 The yellow sculpture looked like another Lee Littlefield, and it seemed like there was a third in the back yard. This is an amazing collection of sculpture, and there's even more than what I've photographed! Except for the pieces that are obviously by Lee Littlefield, I have no idea who created these works. 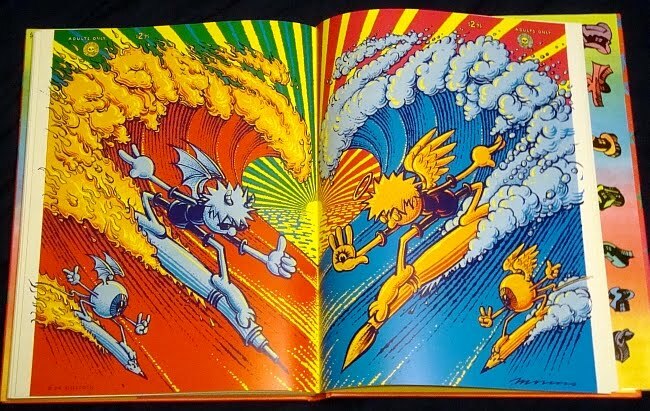 Can any Pan readers identify them? But wait--that's not all. 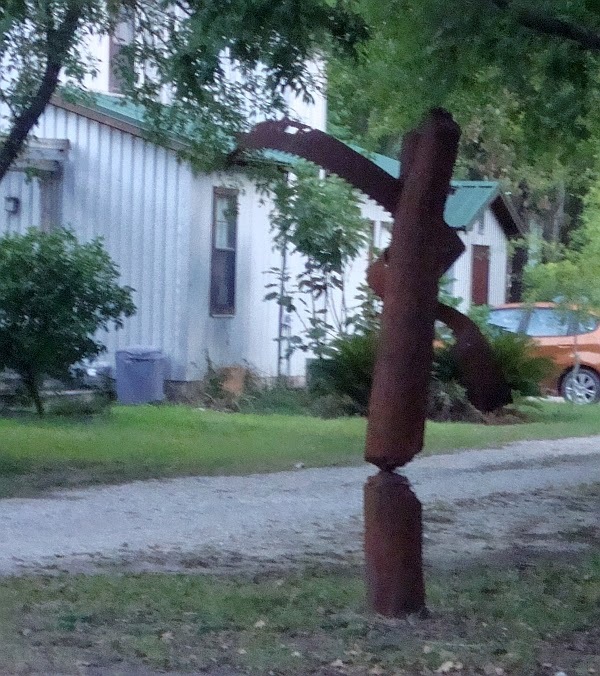 There were just as many sculptures in the yards of three houses across the street. I didn't get as many photos because the sculptures were further back in the property, and I didn't want to skulk around in case they were shoot-first-ask-questions-later types. But here are a couple of photos. 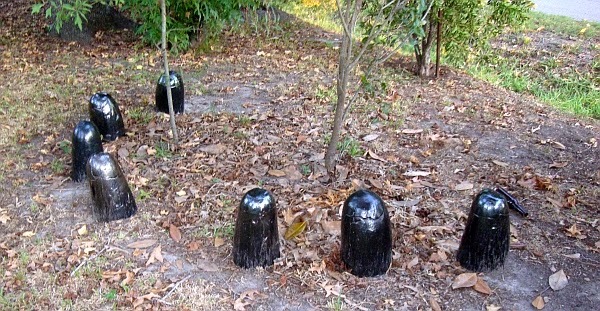 These sculptures appeared to be at the addresses 331, 331 1/2, 405 and 414 Martin St. I was curious as to who owned them, but I didn't think to knock on the doors and ask. So I thought I'd do the next best thing--look them up on HCAD, Harris County's internet accessible property database. And what do you know--Lee and Eliza Littlefield live at 414 Martin Street. 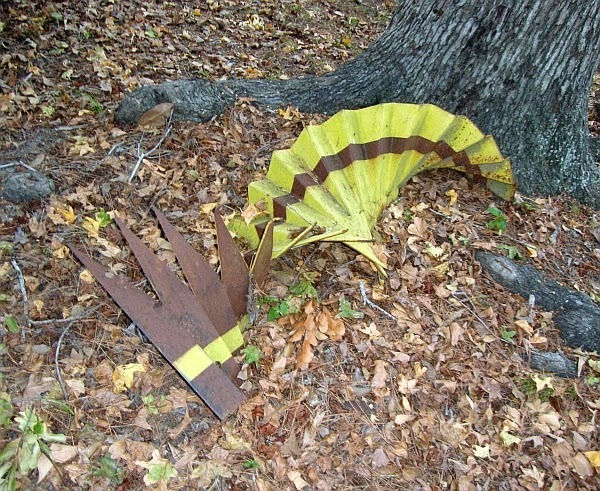 Those sculptures look like Lee Littlefield sculptures for a good reason! Someone named Brian Owens owns the property at 331 Martin, which has two really nice looking houses on it as well as lots of sculpture. 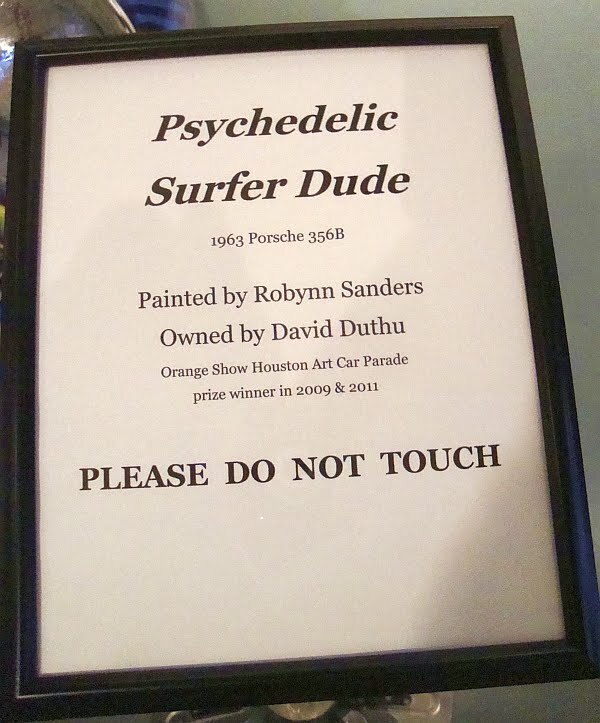 His name doesn't mean anything to me, but he may be renting houses to artists there. 405 Martin is owned by Magdalene Boltz-Topp, who is also an artist. But that's not all--according to HCAD, sculptors Paul Kittleson and Carter Ernst co-own the property right next door to the Littlefields. So with Independence Art Studios on Janisch Rd., and a whole bunch of sculptors on Martin St., I think we can say that this is a little hidden art neighborhood. And if it follows the pattern of other art neighborhoods like Montrose and Rice Military, in 25 years or so, it will be full of expensive townhomes. So my advice is to buy now--or at least take a drive over past the Littlefield's home--it's worth checking out.